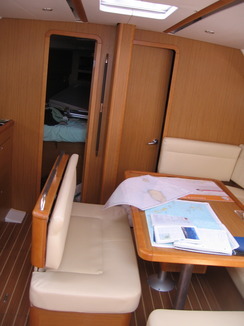 Images from the 2011 Boston Sailing Center training cruises. 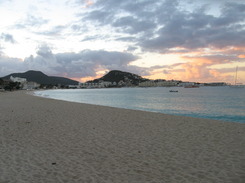 Three one-week cruises ran from St Maarten to various nearby islands. The cruises were oriented more towards training than touring. A tip of the hat to two of our crew who departed the training yacht, Ti Zeff, and boarded a 40 footer for another week of cruising as tourists. View of the Bay from Bernard and Jill's home. 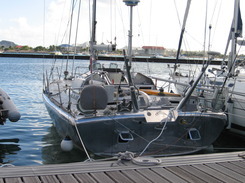 In 2004 and 2005, Norman with son Andrew anchored near here aboard their 45 racing sloop, Rumor. 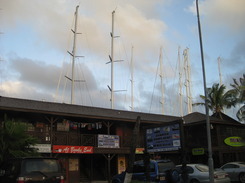 Nothing says "St Maarten" like the masts projecting up from behind the storefronts at Palapa Marina. There are four mega-yacht marinas in the area close by the Dutch Bridge. Palapa was one of the first. 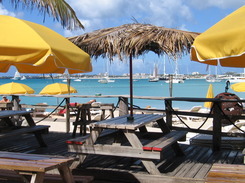 Ti Zeff means "little breeze" in creole. 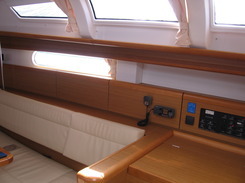 She is a fast boat and moves in little breeze. We had none but given how fast she flies in a strong breeze one may extrapolate. 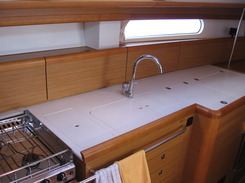 The boat is a Jeanneau 44i performance model with four private cabins and two heads with showers. 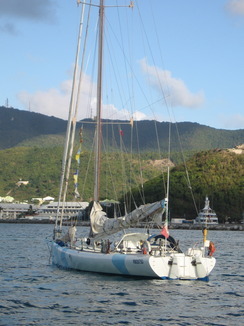 An Italian Open60 at anchor in Marigot Harbor. A French Open40 made from aircraft grade aluminum and polished to perfection. 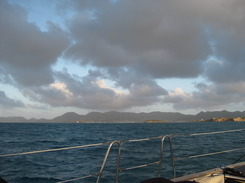 Clouds mean wind and the second crew got plenty of windy sailing. It blew hard and the guys got a taste of sailing in winds to 30 knots day after day. Thanks Joe for the image. 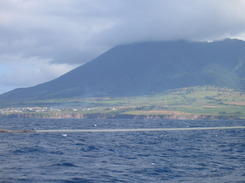 St Eustatia or "Statia" Island is the old Golden Rock of 17th and 18th century Caribbean history. Warehouses lined the water front. 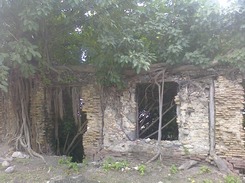 Some still remain as ruins, symbols of past commerce. We had breakfast at The Old Gin House on the waterfront before clearing in. Take-aways from the three cruises? Sailing is a team sport. Cruising is about sailing some place and exploring ashore for as long as possible. The windlass is your friend. Baked brie with fresh baguette is as fine a lunch as can be served. Each island has its own character. Each harbor is unique.